The pros and cons of acrylic aquariums are very similar to those of all glass aquariums. Acrylic aquariums have become more and more popular with tropical fish keeping enthusiasts. Acrylic tanks are much lighter than glass aquariums and are popular with fish keepers setting up extra large aquariums, especially marine aquariums. Tanks over 180 gallons are frequently constructed from acrylic rather than glass. The difference in weight between glass and acrylic in these sizes is substantial, and when weight is an issue, acrylic tanks usually win the day. An 8 foot long 250 gallon tank weighs well over 500 pounds empty. Moving a tank of this size up a flight of stairs, or anywhere for that matter is a major feat. You also need to consider rated capacity of the sub flooring when situating a tropical fish tank of this size. Acrylic tanks offer a greater variety of shapes than glass tanks. Acrylic tanks come in cubes, round columns, corner, hexagon, octogon, bow front, half globe and almsot any other configuration you can think of. 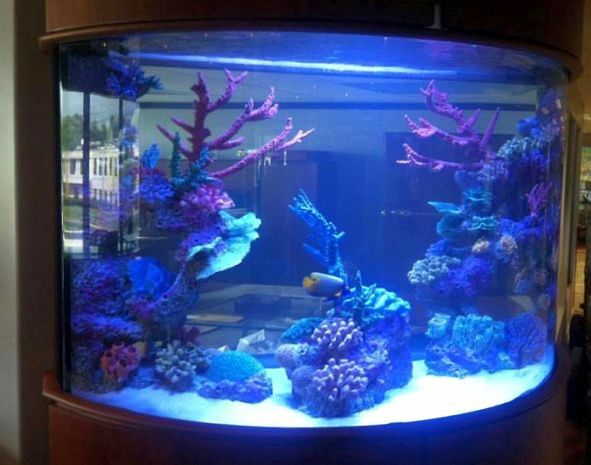 Shaped acrylic aquariums are cool but impact the viewing of your fish. A curved acrylic tank distorts the view of the residents inside the tank. Affordability is also a major consideration with acrylic aquariums. Acrylic aquariums are considerably more expensive than glass aquariums. This is primarily due to the cost of the materials and the labor involved in tank construction. Despite their cost, acrylic aquariums are much stronger than glass tanks and seldom break, however they are susceptable to scratching. The main con for acrylic tanks is the fact that they scratch easily. You need to exercise extreme caution when placing rocks, coral, sand, gravel or decorations around the tank. You also need to be careful when cleaning the inside surfaces of the tank when algae accumulates. Although special tools are made just for cleaning acrylic tanks, you still need to exercise caution. Clearer than glass. Acrylic tanks have no tint.